Following an outcry of fan feedback in response to Mass Effect 3's controversial, and somewhat ambiguous endings, Bioware has announced new Extended Cut downloadable content is in the works. While little specifics were given, Bioware has stated that while the new DLC will not change the conclusion of the game outright. It will, however, answer many questions that the were originally left unanswered, with the addition of new cinematics and epilogue scenes. Bioware has been listening to their fans, and has struck what they believe to be a creative balance; addressing concerns over the ending, without compromising their artistic integrity in the process. The Extended Cut DLC will be freely available for all versions of the game sometime this summer. Bioware released the PC requirements for Mass Effect 3 on the Bioware forums yesterday. They are listed below. In the post on the forum they also announced the release date for the upcoming demo. Bioware intends to compete with Valentines day on the release of the demo this February 14, 2012. The game is slated for release this March 6 and will be available for PC, Xbox, and PS3. Here are the specs for the PC release. OS - Windows XP SP3/Vista SP1, Win 7 *Supported chipsets: NVIDIA 7900 or better; ATI X1800 or better. Please note that NVIDIA GeForce 9300, 8500, 8400, and 8300 are below minimum system requirements, as are AMD/ATI Radeon HD3200, HD3300, and HD4350. Updates to your video and sound card drivers may be required. 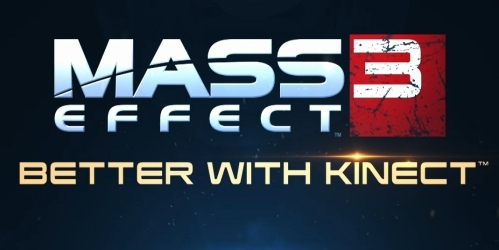 Following the announcement that Mass Effect 3 would support voice commands via Kinect, speculation has been running rampant as to how it was going to work. Microsoft and Bioware have revealed a tantalizing glimpse as to this Kinect exclusive functionality, and we were there first hand to try it out. Last week, at a special invite only press event, Bioware showed us exactly how seamless in-game voice command can be. Although it has been announced that the game will support voice both for dialog and commands, it was the latter that Bioware chose to showcase in this demo. In the demo, Shepard is tasked with saving a certain Krogan female from an onslaught of Cerberus operatives. This combat heavy segment was an ideal scenario to try out the new voice command functionality. After a brief introduction by one of the on-site Bioware representatives, we were given the opportunity to try the game for ourselves. 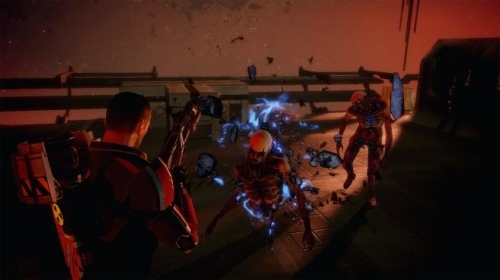 Combat mechanics are virtually identical to that of Mass Effect 2, which was to be expected, but now have the added benefit of full voice support. Just about anything that was previously assigned to a button command (with the exception of fire and reload, both of which currently are controller only) can now be accessed simply by one's voice. This year's Electronic Entertainment Expo gave way to several new exciting new reveals for fans of the Mass Effect franchise. Bioware detailed new Kinect functionality, a new gameplay trailer, and has now locked down a release date for Mass Effect 3. While some may be skeptical about the prospect of using Kinect in an RPG, skeptics can rest assured; the new functionality is optional, and does not entail the use of gesture based controls. Based upon the live stage demo of Mass Effect 3 that was held at EA's Game Changers event, Kinect is being leveraged primarily as a method of voice command in game. Using the device, players may complete dialog trees without the necessity of a controller, and can also dictate tactical orders to other team members. EA, the second company to hold their E3 press conference today, did so at The Orpheum Theater. The theme of this year's event was "Game Changers", which, based upon the stellar lineup EA showed at the event, was indeed an apt title. The conference began with a brief Mass Effect 3 live gameplay demo, followed by a brand new trailer. EA did not, however, show the newly announced Kinect functionality, as they did so previously at Microsoft's event. Mass Effect 3 has been slated for a March 6, 2012 release. Following the ME3 demo, EA conducted a live demo of Need for Speed: The Run. While borrowing certain elements from previous titles in the series (most notably, the chase portions from Need for Speed: Most Wanted) it was clear from the onset that this wasn't just another title in the Need for Speed franchise. In a surprising move, for the first time ever in a Need for Speed game, The Run also features several on foot segments. These "out of car" moments, as EA describes them, are action sequences, wherein the player has to evade their pursuers by all means necessary, and are played out through a series of QTE style events.